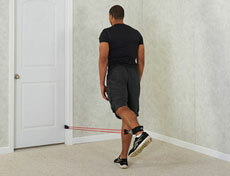 Facing door, wrap the ankle strap securely around R toe, and get down on all fours. Keep your abs tight, inhale and drive R knee in towards chest. Exhale and fully extend R leg back so that it’s parallel to the ground. Tip: Be sure to keep your core engaged throughout the entire movement. Wrap the ankle strap securely around R ankle. Attach both ends of desired band combination to strap. Facing door, step away until slight tension is felt in band(s). Begin with a deep breath – exhale and press R heel back and up with a straight leg. Lean back slightly to engage core. Lift and lower R leg as high as possible – pressing L hip into mat. Do not allow heel to touch mat between repetitions.